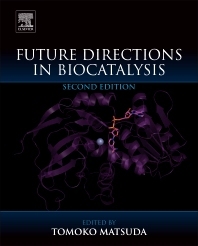 Future Directions in Biocatalysis, Second Edition, presents the future direction and latest research on how to utilize enzymes, i.e., natural catalysts, to make medicines and other necessities for humans. It emphasizes the most important and unique research on biocatalysis instead of simply detailing the ABC’s on the topic. This book is an indispensable tool for new researchers in the field to help identify specific needs, start new projects that address current environmental concerns, and develop techniques based on green technology. It provides invaluable hints and clues for conducting new research on enzymes, with final sections outlining future directions in biocatalysis further expanding the science into new applications. Tomoko Matsuda is an Associate Professor at the School of Life Science and Technology, Tokyo Institute of Technology. For 20 years, her research has been focused on the organic synthesis with enzymes, biocatalysis, and particularly the study of enzymatic reactions in a non-aqueous solvent. Her group has achieved the waste-minimization in large-scale production of chiral compounds with a flow system using liquid and supercritical carbon dioxide as a solvent and an immobilized lipase as a catalyst.